Good Morning! I had tried to get my card done last night, but my printer wasn't cooperating so I'm a little later than usual with my post. But I am still pleased with the results. I used the sketch from Mojo Monday and the challenge over at Digital Tuesday was to add some glitter. 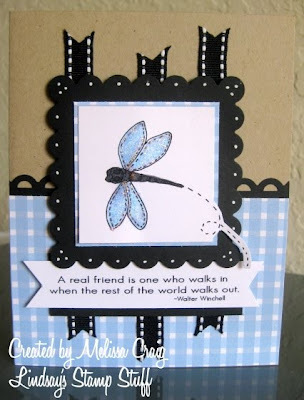 Well, no dragonfly, in my book, have have glitterless wings. LOL! He's part of the Doodle Flowers set and so is the sentiment. It's an awesome set! What do you think? I love the contrast between the black and baby blue and then having it all grounded by a Kraft base. In this photo you can see the glitter. I had a little accident with the Stickles bottle this morning. It got clogged so as I was working to get cleared, I pressed a little too hard and a big clump came out! So there's a bit of glitter on his body that wasn't meant to be there. I hope you like this card. Now head on over to Lindsay's blog - she's always got a freebie to share along with some awesome ideas!! fab card!! funny you & I both used teh same saying this week! 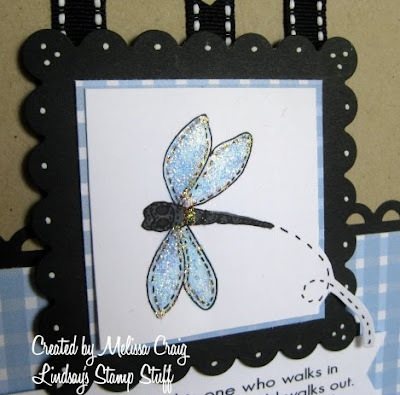 I love the bling on the dragonfly and your layout is fantastic! Neat card! Love the contrast and the way you used the ribbons! Love that black stitched ribbon! Great work! Wow...great color combination and that butterfly is super fine with all that glitz! Wow very cute card your very talented. Very cool color combo and love that layout. Awesome card! Mel, I love the sparkly dragonfly!!Gorgeous! I agree Melissa I love the baby blue and black combo!! I love your sparkly dragonfly to and don't worry I think that extra stickles gives him character!! Great job!! Awww, this is so sweet! I love the colors you used. Love the black and baby blue! Such a great card. Makes me want to run and do something with the dragonfly. Ohhh, just love your dragonfly!! Miss, this card is just fabulous! I love it. I love the blue paper. Great card. wowsers love it. Awesome coloring and love the glitter!!! Love that combo of blue/white checkered with the black scalloped square. Gorgeous. Bee Crafty #34 - Let's Hit the Beach! Tuesday Morning Sketches 1st Birthday!